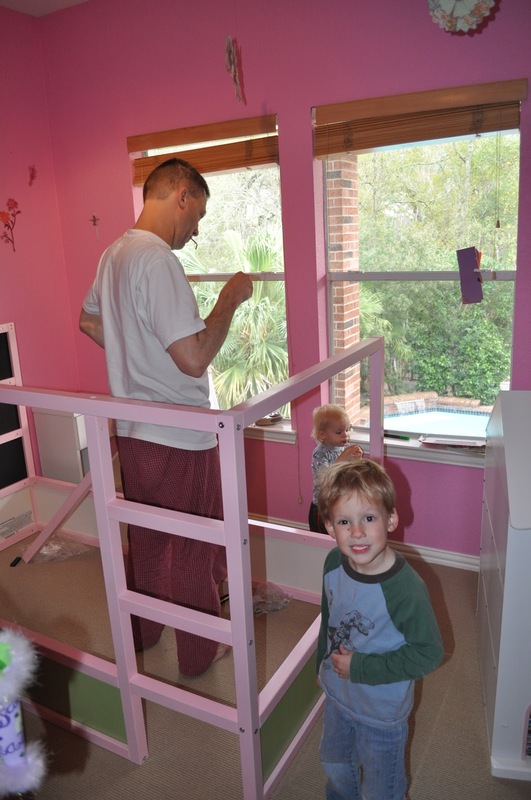 For anyone interested, here’s how our family transformed (hacked) four Kura beds into exactly what we wanted for our four kids (a pink/green garden for the girls’ room and a fire engine and police car for the boys’ room). So fun. I highly recommend the whole crazy process. First, we took the Kura beds out of their boxes and spray-painted all the wood. It was a spray-painting extravaganza! Made extra fun by the challenge of keeping the pieces for each bed together. Spray paint worked so well on the unprimed IKEA wood. Especially the bright colors covered very easily. We used glossy spray paint that also contained primer. My husband has a knack with IKEA furniture, so he pictured the whole assembly in his mind…and then figured out which side of which board needed to be spray-painted with chalkboard paint so the kids could use it in their Areas. The flip side of each panel we did green for the girls and silver (like fire-truck or police-car silver) for the boys. Oh. And we spray-painted our driveway. Oops. All in the name of an awesome IKEA rebuild. Our oldest son and my husband fit each bed together. Sam wants to grow up and understand IKEA beds too. We can all dream. We had to assemble the beds in the kids’ rooms because they’re too big to fit through an average doorway. How long does it take to assemble an IKEA Kura bed? Or four? A couple of hours for my husband. But that might be a bit fast, because we got pretty experienced at it. Let’s be clear that the assembly would take me a couple of weeks. Remodeled Kura Bed! We later added a fire phone, steering wheel, and fire hose to truly pimp out his bead. Here’s the bed in his room, reversed so it’s a low loft bed. Perfect for a four-year-old. Here’s Nate with the tricked-out Kura bed, calling 911. Kidding. We easily fit two Kura beds in the girls’ (somewhat) small room. The loft bed gives each girl space of her own in their “area.” It was hard for me to imagine them sleeping above/below one another. After a day all up in each other’s business, they need the space. Truly a family project. So fun. Hope the kids learned something about hard work paying off or realizing your dreams. Or how versatile the Swedes are. This is where the kids started to embrace the idea of their own beds. For us, so much better than bunk beds. Elisabeth enjoying the view from her bed while M and the kids put the finishing touches on the last one. The kids (even our one-year-old) helped add the slats. Curtains! Did you know the rod on a Kura bed is the same length as a shower curtain? We got some rods and standard-sizes curtains. We cut each curtain to the right length, and then hung the bottom on the other side, so there are two curtains on each bed. The kids can part them or keep them closed. I considered using the scraps as matching window valances. Perfect size! But then I remembered that I don’t sew. If you do, and want to make some valances, let me know. Christmas lights! We found these super-cool (to the touch) lights and strung them with zip ties on the bottom of each bed. Such a perfect touch and the kids love them. RAST tables from IKEA! They work perfectly to hold the large Trofast bins. 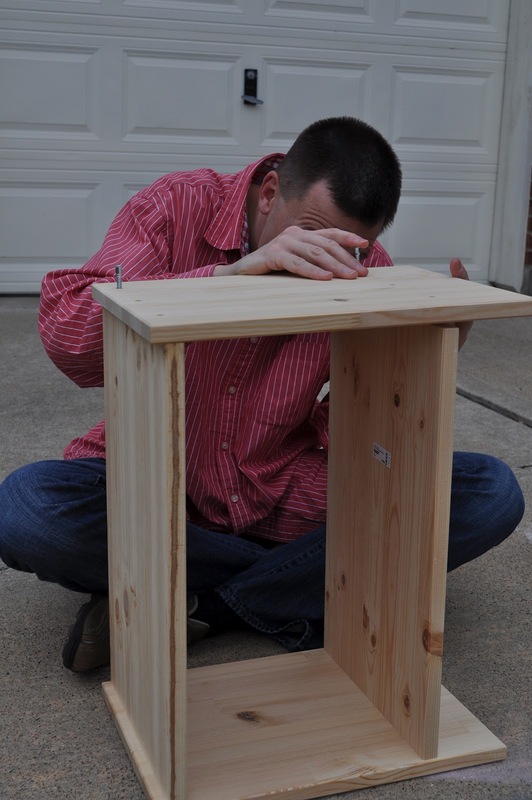 It also serves as a lightweight desk for the kids to use during Rest Time. And so easy to put together that a one-year-old can do it. Or help. Or watch. We assembled the RAST tables first and then painted them. I don’t remember why. Sorry. Elisabeth got right in there and screwed it together. She loved that she helped. Catie’s RAST table, complete with chalkboard paint. The “Area” underneath Elisabeth’s bed. Complete with desk, chair, and bulletin board to display her artwork! Catie’s chalkboard, on the inside of her “area,” complete with her artwork. Catie’s “Area” with lights, curtains, chair, and RAST table. You can’t see the mess. Yea! Elisabeth on top of her bed, complete with BLUMA lights, pails on her RAST table, and bulletin board. Love it! 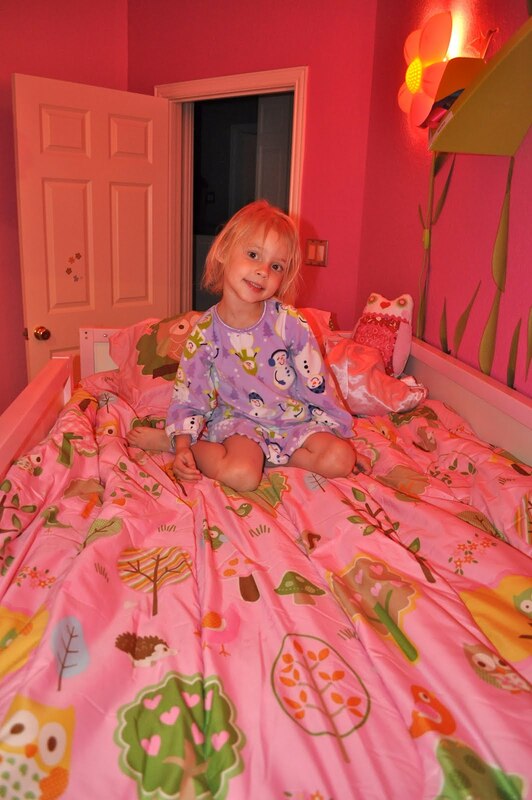 Elisabeth’s Owl bedding from Grandma and Papa. IKEA shelves…that look like petals for the BLUMA lights. So cute. So handy. Finished Product for the boys’ room…complete with a Fire Dog. Sam’s “Area”with TROFAST shelves for his clothes, accessible from both his “Area” and the other side. 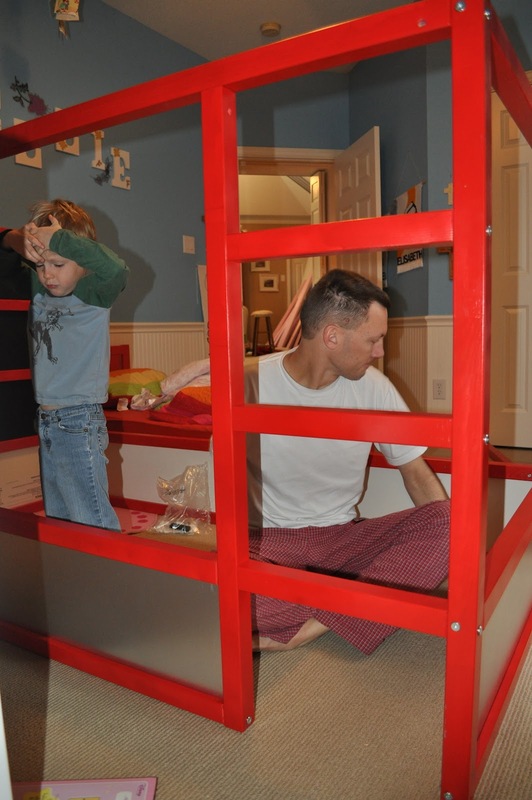 The boys’ beds…TROFAST shelves…police car blue and fire engine red. Nate’s police car KURA bed…reversed so it’s nice and low for him…once he’s out of his crib. Sam’s “Area” complete with bulletin board, fire fighters, curtains, lights. And Husker Football helmet. TROFAST shelves, covered with shag carpet from IKEA, to make them non-slip for little feet. Yes. That’s a flashing fire-engine light. Our little assistant. Hanging out in Bubba’s bed, making it happen. Thanks again for checking out our IKEA hacks! Wow I Love the rooms! I’m a friend of Jen’s (Kendra) and I’ve been hearing all about these beds. Your kids rooms look so amazing! wow the makeovers are amazing! They have given me lots of inspiration – I’m currently in the middle of doing my son’s room. I’m not brave enough to take the bed apart and attempt to put it together again though – well done! Gonna get one for my son soon, how much paint did it take to do one bed would you say? I think it took about three cans apiece. Thanks! 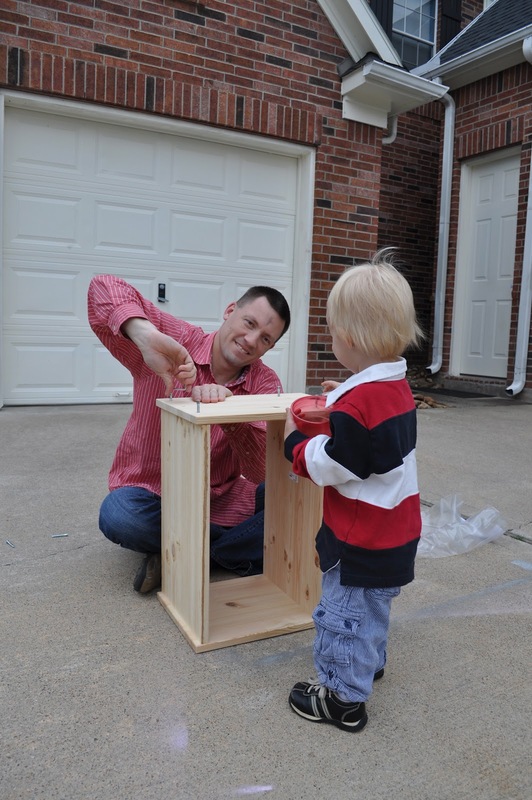 Thank you, we are heading to ikea probably this week or next to get to work on it, going for an Auburn Tigers theme. Navy frame with orange panels and auburn comforter and pillow cases I bought. Both sides of my family are huge Auburn fans so I figured, why not, he is going to be indoctrinated in to it anyway. OMG…adorable! You are brilliant! Thanks for the ideas!! Love the beds–gives me some fun ideas for my son’s Kura (right now it is just a mess of toys underneath)–can you tell me where you found the cool-to-the-touch Christmas lights? They were a bit pricier than normal Christmas lights, but none are burned out yet. And, obviously, our kids aren’t stellar about remembering to turn them off. Hi! 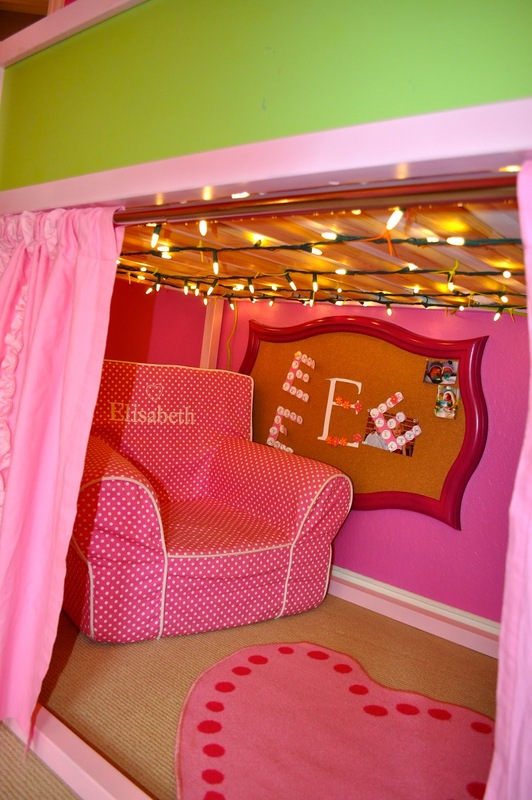 Completely copying your idea for the girls bedroom! Can you tell me how many cans of pink and green spaypaint that you used? I’m probably going to do green chalkboard paint instead of the green spray. Love the idea. Already have the bed, drop sheets, shower curtain, pink curtain and lights! Just need to paint and put it together! You’re going to love these beds! We used two cans of each color. It was high-quality, thick paint that really covered well. The rooms look fantastic. I have one of these beds already for my 3.5 year old. I have been trying to figure out a way to hang curtains and I was leary about using screws so your shower rod idea is gold. I just couldn’t drill holes into it as I’m sure you understand. Anyway, I have a question that’s a little off point but I think you are kind of an expert since you have for babies. I have two boys and I’m trying to figure out when I can flip the bed over. My 15 month old will get his own bed when he turns two. But my 3.5 year old would love to flip the bed over. At what age do you feel like your kids were ready to move up top? I know all kids are individual but I’m curious what other moms are doing. You’re right that every kid is different. And, of course, you have to be so safe about where your little ones sleep, since they’re unsupervised. But my kids were four when we built them these beds, and I think they definitely would have been ready and 3.5. The Kura beds have such a high wall around them, it would be hard for them to tumble out. We’re considering flipping the bed or our (almost) three year old soon. Good luck! My son got this bed at 4 and I made him wait till he was 5 to flip it (bed says 6) but my 3 yr old loves his bed and i may get her one and flip it since they share a room and we need the room. How’s that for a runnon? Rule is no standing though. It really would be nice to get some floor space but I don’t want him to have any stress. Okay, so now I have a new question. ;) I’m using an Ikea mattress that’s a memory foam. I don’t know the name but I think it’s the more expensive one. I have slept with him many times when he was sick or just needed some love. I wake up in the morning and I can hardly roll over. I feel like somebody beat me with a bat!! I’m wondering if you all use “real” mattresses. I know there is a hight limit if you flip the think over but I’m worried that the mattress he is using isn’t good for his little body either. I asked him tonight if the mattress made him hurt in the morning and he said yes, but then again it’s kind of a stupid question to ask a 3.5 year old. He might be trying to be funny or he might not understand the question….. So the question is: What type of mattress do you use and how high is it? He is an old soul! He and his brother are so funny and dramatic and yet he is so mature that he really surprises me with the things he says. What brand and color of spray paint did you use for the girls beds? I’m totally copying this! What brand of spray paint did you use for the girls room? I know you said it had the primer in it, just wondering what brand was thick and gave good coverage…also, did you have to sand or do anything first to make it stick? he brand was RustOleum Ultra Cover 2X. Good luck! Did you have to sand the blue/ white panels first or did you just spray paint straight onto them? I have a bed already in my daughter’s room and this technique would make it really personal for her. I’d love to know the answer to the question and also the brand of spray paint, if you can remember. We didn’t have to spray the panels. They took the paint really well. The brand was RustOleum Ultra Cover 2X. Good luck! Your daughter will love it! Hi Christina, can you tell me what is the name / tone of color that you used for the girls bedroom walls and bed(spray paint). I am in love with your daughters room. Thanks for sharing. Do you remember where you found the pink curtains? Target! They were part of the pink owl series. Good luck! Christina – Do you happen to know the height between the floor and the bottom of the loft bed (when it’s flipped with the bed on top)? Ikea only gives the total bed height. I’m trying to figure out what I could fit under there : ) Thanks! 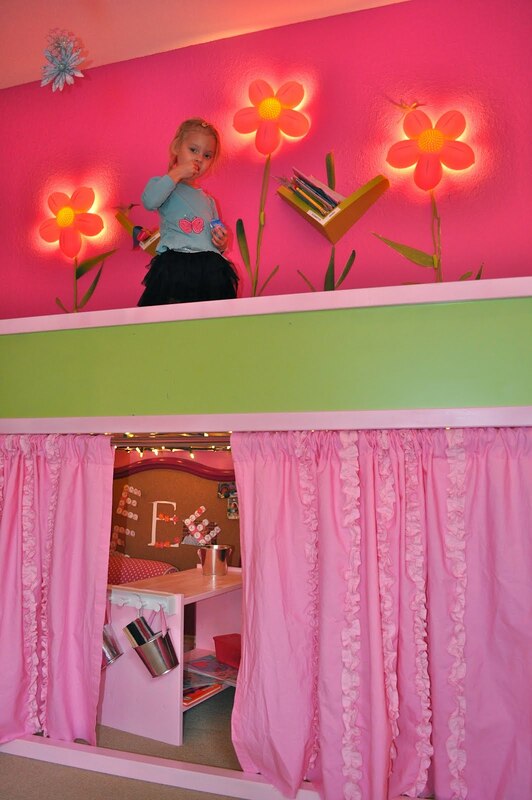 And I’ll totally be using your idea of the flower lights with the shelf “leaves” – love it! Love the idea! We are doing four as well. Question. 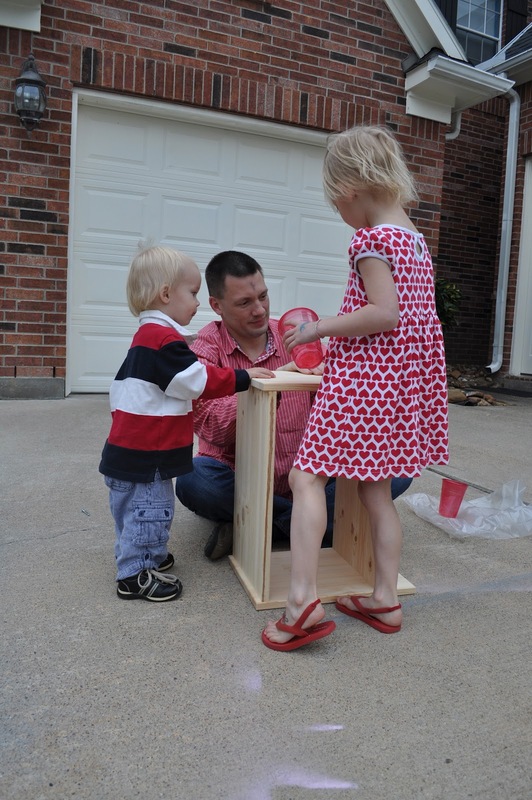 Did you put any type of sealant spray after you did the colors and the chalkboard paint? I just finished painting one.. but wasn’t sure if I needed to do another step. Thank you! Nope. No sealant. After a year of heavy use (obviously, with kids) they still look great. Good luck! I love this idea! We are going to make a fire truck Kura this week and I am just curious, did you find that the spray paint was tacky to the touch at all after it dried? I sprayed an end table 6 months ago (I think it was valspar spray paint from Lowes) and picture frames still make grooves in it! And it was only one coat and satin finish too not glossy. Thanks for the input! No, the spray paint is not still tacky. I’m not sure. Maybe the brand? Maybe the wood? The Kura wood soaked the paint up nicely. Best of luck to you! Cool thanks! Maybe it was the surface of the table I sprayed that kept the paint tacky. It has so many grooves from every time the picture frames have been moved. It was dry, but you could push your nail into it. I bought the paint last night and can’t wait for the rain to stop so I can get started!! What sort of rod did you use to hang the curtain and how did you affix it to the beds? Thanks! How did you fasten the x-mas lights to the top? I absolutely love it! What ingenuity. 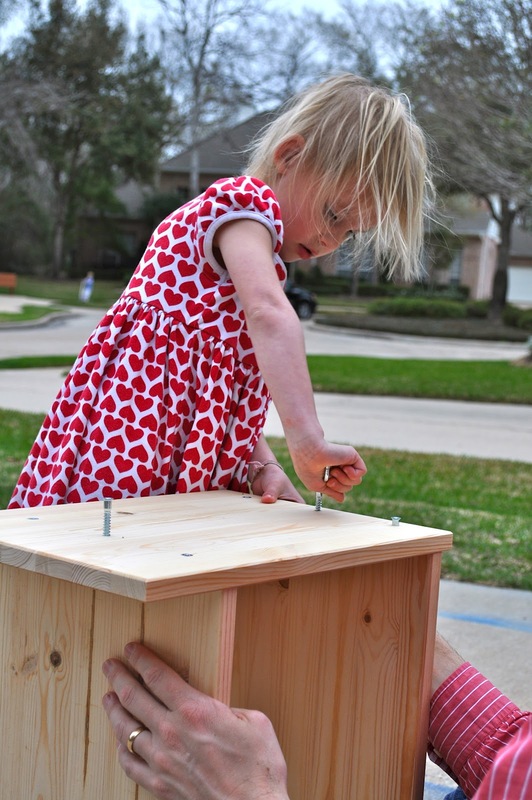 And your husband – you should rent him out if he can assemble IKEA furniture that quickly. omg I love your detailed post! I wish I had found this before I did my Ikea Hack (based it on some others I stumbled across on Pinterest). I’ll need to check out your cool to touch lights. I don’t know what kind of paint my friend used to spray our frame, but it definitely chipped off easily. Did your hubby primer the frame at all before spraying it? where can i buy the chalk board? Hi, just wondering what you used to adhere the carpet to the Trofast shelves? Hey there. We used a heavy-duty stapler to adhere the carpet. Where did you get the BLUMA pink petal lights? The BLUMA lights are available at IKEA. At our Houston IKEA, they are downstairs in the lighting section. I hope this helps! I love the Kura makeovers– so cute!! Where did you get the L shaped shelves? Can’t find them on Ikea. They are the Trofast shelves, Beth. Thanks for reading! Thank you for this post! I just finished painting the frame and wallpapering the panels, one quick question- did you sand the wood frame before spray painting it? Hi Lauren…We did not spray paint the wood frame. Two years later and we’ve had no peeling paint. I’d consider that a success ! Thank you for your very detailed post! We just found a Kura bed on craigslist for $50 and I painted it green and blue for my son. It turned out absolutely perfect! I had a question about the curtains, when you cut them did you do anything to the bottom of them so they don’t fray? Thanks! They have frayed a bit, but we just cut off the loose strings. Two years later, and the curtains still look good. Great idea! Gonna do the same! The lights w/ the cables by the sleeping area make me nervous though! The spray paint completely dried in about 24 hours. We did two full coats. Good, good luck with your IKEA hack! 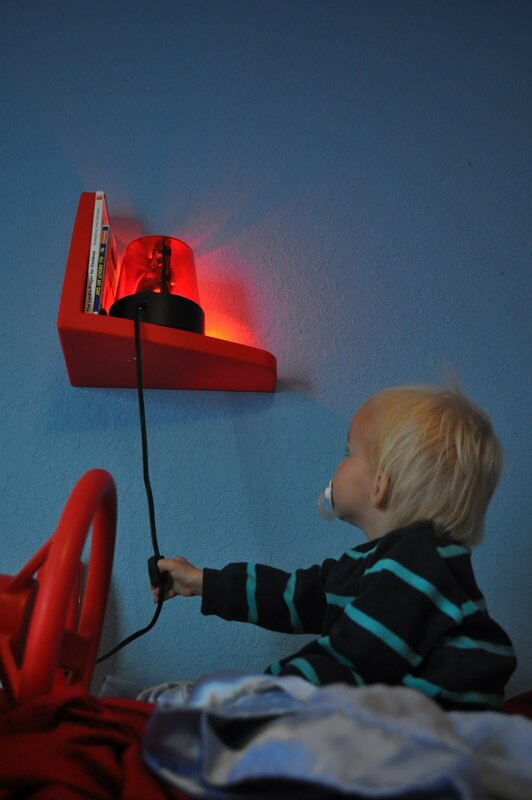 Perfect for my boys’ room – thanks for the details! I am totally jealous. I have not been able to successfully paint this bed. Painted it without a primer and the paint peeled off in sheets. Also, it never cured and was tacky til the day it was scraped off (literally months of hoping it would cure) Scraped all the paint off, bought a bonding primer highly recommended on several other blogs. Tested a patch on unsanded wood (like it says is possible on the can) scrapes right off. Tested the primer after using 220 grit (like several blogs suggested) and still it scraped off with my fingernail. Gave it a hard sand with 100 grit and tested it and finally got a decent bond. So, now I am almost finished prepping it to prime. I am amazed the the spray paint did the job without sanding or priming and completely jealous. I have been working in this (very off and on since it’s on me to do by myself and I have a couple of preschoolers) for nearly a year now. I would love to take it out and burn it but my girls need a place to sleep and I have already invested so much time. Sigh. Congrats on picking some good paint! Hi! Did you find that you needed to sand or prime the panels before painting them? Love it! Question, where did you get the bulletin boards? Thanks! We got them at Kirklands. Hi, did you have to apply any primer when spray painting the panels? or did the spray paint with primer did the job? I think maybe you’re right, Naomi. Had I known it’d take me this long I would have painted the frame white (the ones we bought have white panels) and then called it good. I don’t know if you’ll even get this, but if you have the Kura in the Low Bed position, can you leave off the front bottom panels and use it for storage? Or does it compromise the stability? Thank you! Love what you did for your children! I will be buying my son’s Kura bed tomorrow and want to paint it white. I am worried that spray paint will chip off though. Has yours still stayed intact? I read through the comments and saw someone had an issue with it being tacky. Did you experience any of this? I want to make sure it comes out great like yours!! I really want to paint our Kura but the frame looks like it has a clear coat so I think I’ll h e to sand it. I’ve heard people say their paint scratched off easily. Did your bed some with a clear coat or unfinished? I wonder if IKea has changed them since you painted yours.